As an avid cyclist and novice pilot, I’ve struck by the similarities and differences between Strava and Foreflight. Both are GPS-based subscription services that were launched less than a decade ago and have become pervasive and powerful. Both have been helped by the the rise of the iPhone and the iPad. Both have complicated relationships with Garmin. Both are excellent companies full of passionate people making something that they love better for everyone. Strava and Foreflight have pursued slightly different strategies. It’s interesting to compare them. 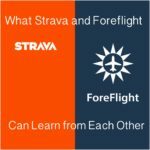 Although I’m reluctant to make any recommendations to either of these successful and thriving businesses, I think that Strava could benefit from adopting elements of Foreflight’s rapid innovation and “fanatical pilot support”, and Foreflight might be improved by adding some of Strava’s social elements. 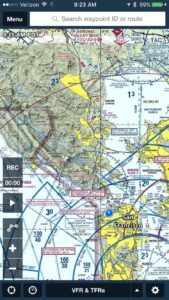 A Primer – What’s Foreflight? What’s Strava? 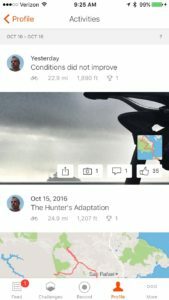 Strava is an app that uses GPS to allow cyclists and other athletes to record and share their activities. Although Strava is growing fast in running and other sports, my research shows that cycling is still Strava’s biggest market. Strava launched in 2009 and gained a following among avid cyclists (I was the 5,866th person to join) through its segments and competition features, which allowed cyclists to designate any stretch of road as a virtual race and to compare performances and times. As Strava has grown it’s become more about following and sharing the activities of friends, a social network for cyclists. Strava now has over 17 million users (!). My research suggests that they have about 2.5 million active users and a few hundred thousand premium users, who pay $60 per year for enhanced services. Strava has 100 employees and has raised tens of millions of venture capital funding. Strava is going for growth. The free version of the service is very robust so only the most avid users subscribe for premium features. Foreflight is the dominant app for pilots. Its key feature is interactive mapping which shows the location of an airplane directly on to the official FAA navigational charts. Ideally this can serve and integrate the functions of both the often clunky built-in GPS on the plane and the time-tested paper chart on the pilot’s lap. Foreflight does a lot more than that – it provides crucial weather information, flight planning, notice of legal restrictions, airport diagrams, communication frequencies, and countless other features. Basically, if you say to yourself, “Gee, it would be useful if Foreflight allowed you to ______” you can be pretty sure that Foreflight already has that feature. It’s amazing. It’s even more amazing when one realizes that Foreflight is operating in a highly regulated and bureaucratic business with government agencies as the source of much of their data and huge legal and liability risks. AND pilots tend to older and somewhat scornful of new technology. I know less about Foreflight than I do about Strava, but they launched around 2007, have around 30 employees, are based in Texas (farther from the VC/tech epicenter than S.F.’s Strava) and raised some venture money in 2014. A Foreflight subscription costs $100 per year (and believe me, it’s worth it.) The company doesn’t release subscriber info but I know few active pilots who don’t have it. There are half a million pilots in the U.S., maybe a million in the world, so I’d guess there are maybe 300,000 to 500,000 Foreflight users. Interestingly, Foreflight only works fully on Apple devices, there’s a limited Android offering. This doesn’t seem to be a huge issue because most pilots buy a dedicated iPad that they use primarily for flying and use their iPhone, if they have one, as a backup. Here’s a key difference between Strava and Foreflight – the number of pilots is shrinking. Foreflight has huge share in a shrinking market (maybe innovations like Foreflight that make flying easier and safer will reverse this trend). Strava has only scratched the surface of active sports participants. Strava is used by a large portion of amateur racers and enthusiasts, but is less common among casual cyclists and is less pervasive among runners and other sports. So Strava’s relatively large staff seems focused on sales, marketing, and growth, while Foreflight’s team pushes hard to innovate and improve its product. Strava is a social network. Riders “follow” other riders on Strava and see where they are riding, how much they are training, with whom they’re riding, how fast they are going. It’s possible that a similar idea could be used in Foreflight to create a social network among pilots. I’d love to see where my pilot friends are flying, how they fly certain routes, what types of planes they’re using, etc. This information is already passed around informally in pilot’s lounges, airports, and hangars but the network is limited. Granted there are some scary legal issues involved in posting and sharing GPS routes of every flight. What if the GPS track reveals that a pilot inadvertently violated a minimum altitude requirement, for example? But Foreflight seems to have managed more fraught legal issues than this one. The social aspect of Strava has done a lot to promote cycling, perhaps it could do the same in aviation. Most of what makes Strava useful dates back to the early days of the app when the team was small. To me, the ability to use one’s mobile phone was the last really big innovation. Since then, Strava’s improvements for cycling have been infrequent and incremental, often buried in the “Strava Labs” warehouse. Strava’s creative and hardworking team will object to this observation and point out innovations like heat maps, route planning, photo integration, and other features, but to a user who’s been with Strava from the start it seems that Foreflight’s breadth of features and pace of innovation exceeds Strava’s, even though Foreflight has 1/3 of Strava’s staff. Tiny third-party Strava-powered sites like Veloviewer and Suffervision show how much innovation can be added by just a single passionate programmer. There are so many things that Strava could do – video integration, ride annotations, real-time rider tracking, location tagging like “bike-friendly coffeeshops”, safety and crash marking, event promotion, training analytics, aerodynamic analysis, weather integration – all things that Foreflight would see as central to their mission of “fanatical pilot support”. If Strava pursued “fanatical cyclist support” a lot of users would convert from free to premium. As a cyclist and a pilot I feel lucky to have Strava and Foreflight, tools that have made me better at these activities and enriched my experience with both. I look forward to the future of both Strava and Foreflight with curiosity and optimism.